I came across some spider cookies on Pinterest using peanut butter cups a while ago and despite having a shuddering aversion to spiders, I thought they were really cute. 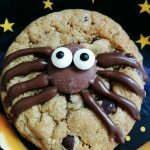 This is my version of spooky spider cookies using chocolate buttons – I hope you give them a try! I really enjoyed making these. 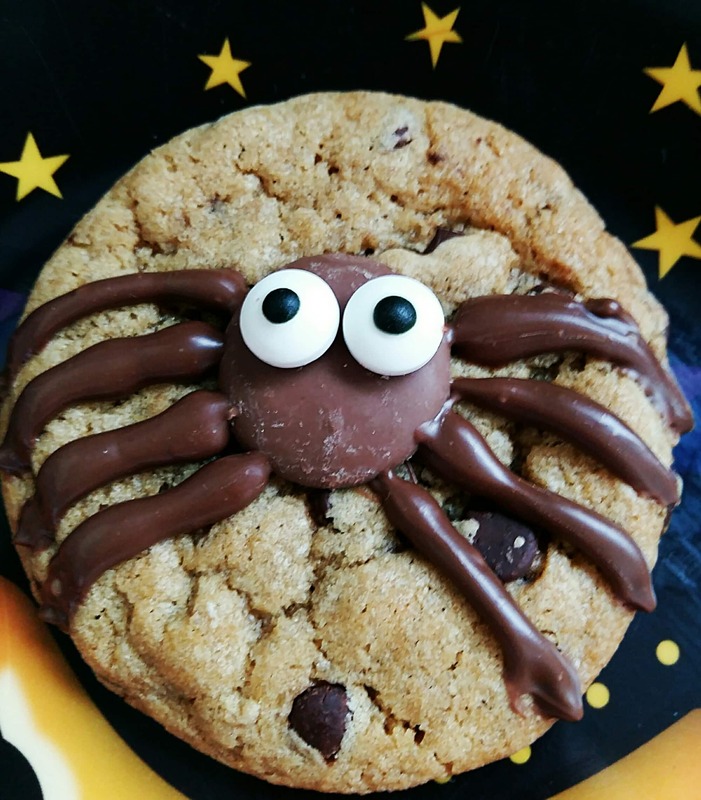 I’m not a fan of spiders at all, but I can’t help but love these fun cookies! If you’re celebrating Halloween, have fun! I won’t be taking part this year because I’ll be in hospital having my little bundle of joy! I’m so excited to meet him after all this time! A cute and spooky twist on the chocolate chip cookie for Halloween! Preheat the oven to 180C. Grease and line 2 or 3 baking sheets. Using a mixer, cream the butter and sugars together until light and fluffy. Gradually add the eggs, beating until the mixture is smooth. Add the vanilla. Sift the flour, baking powder and bicarbonate of soda together over a medium bowl. slowly stir into the creamed mixture, until the mixture becomes a dough. Stir in the chocolate chips. Roll even sized amounts of cookie dough into balls and place them on your baking sheets, leaving about 3-4cm between each one to allow for spreading. Bake in the pre-heated oven for 5 mins, then remove the tray from the oven and bang the tray on a work surface to deflate the cookies. Return to the oven for another 5 mins or until light golden brown. While you’re waiting for the cookies, melt the 100g chocolate and place in a small piping bag fitted with a fine nozzle. 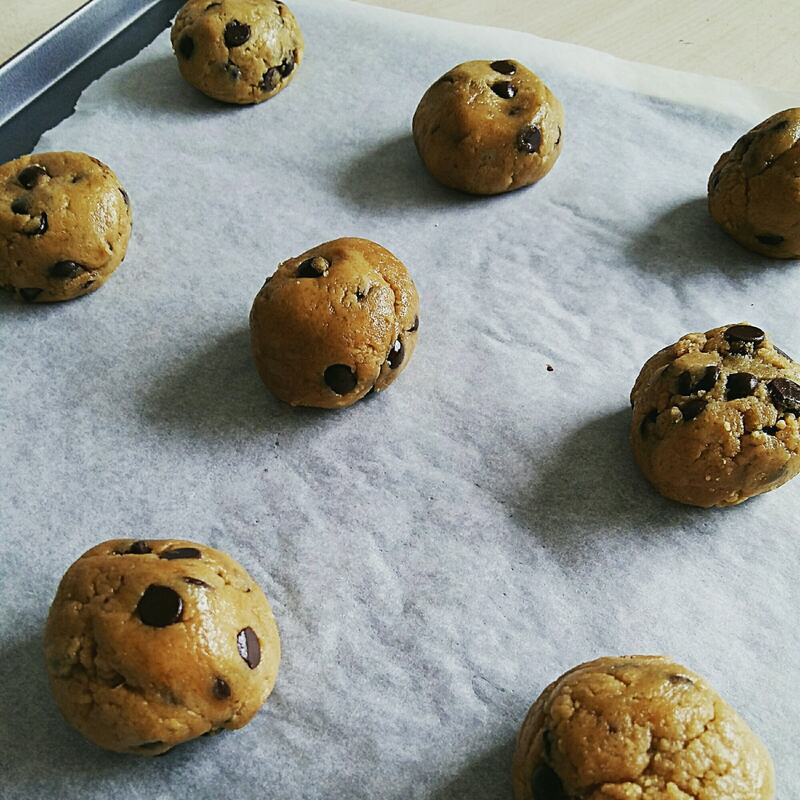 Let the cookies cool on the baking sheets for 5 mins before transferring to a wire rack for 10-20 minutes. While the cookies are still very slightly warm, place a chocolate button in the middle of each cookie, place the candy eyeballs on using a tiny blob of melted chocolate and finally pipe on little spider legs. Leave the cookies for a little while to set the chocolate before serving to your trick or treaters, or guisers as we call them in Scotland! These look so cute!! I mean…. terrifying, hehe. I made similar cookies a couple of years ago for Hallowe’en, although mine were plain vanilla cookies. 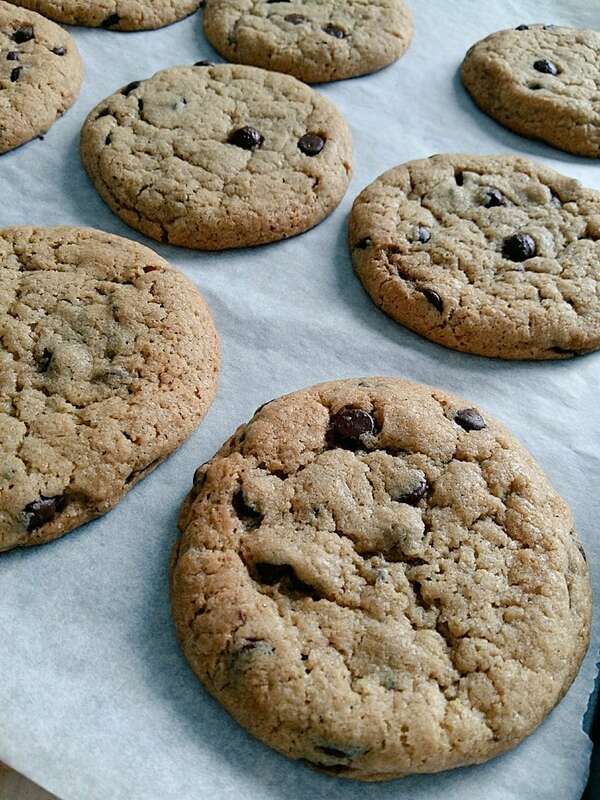 Chocolate chip sounds even tastier!